Bring a large pot of well-salted water to a boil. Working batches, cook the lasagna noodles until they are soft and pliable but not limp, 6 to 7 minutes. Remove the pasta from the boiling water and lay flat on a sheet tray to cool. Reserve. Coat a large saute pan with olive oil and bring to medium-high heat. Add the sausage and cook until brown and crumbly. Remove from pan and reserve on paper towels. Ditch the fat from the pan and add new olive oil along with 2 cloves of garlic and a pinch of crushed red pepper. Bring the pan to medium-high heat. When the garlic becomes golden and very aromatic, remove it from the heat and discard. Toss in the mushrooms and season them with salt. Cook the mushrooms until they are soft and wilted and dark brown, 4 to 5 minutes. Remove from pan and reserve. Repeat this process with the remaining garlic and the zucchini. In a small bowl, combine the ricotta, 1/2 the Parmigiano-Reggiano, the eggs, and the basil. Mix to combine well and season with salt. In the bottom of a 9 by 13-inch deep-dish baking dish, add a couple ladlefuls of sauce and spread out in an even layer. 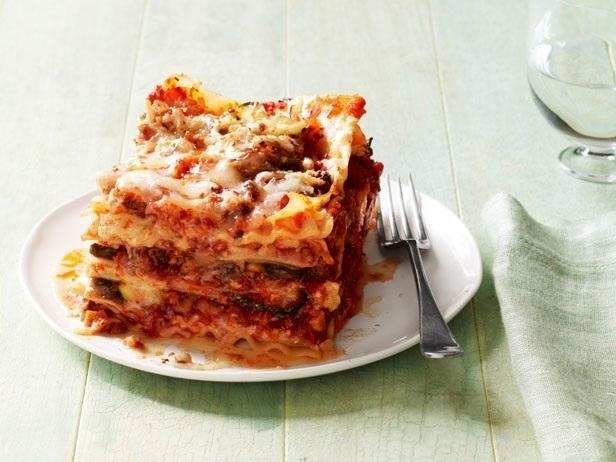 Arrange a layer of the lasagna noodles to completely cover the sauce. Spread 1/3 of the ricotta mixture over the pasta. Place a layer of pasta going in the other direction as the first layer (this will give a little more stability). Spread a light layer of sauce on the pasta and sprinkle 1/3 of the sausage over the sauce, repeat this process with 1/3 of the mushrooms and zucchini. Sprinkle a layer of mozzarella and some of the remaining Parmigiano-Reggiano over the veggies. Repeat these layers until all the ingredients have been used up or the pan is full. Be sure that there is a layer of pasta on top covered with sauce and sprinkled with mozzarella and Parmigiano. Cover with foil. Place the lasagna on a baking sheet and bake in the oven until the lasagna is hot and bubbly, about 1 hour 15 minutes, removing the foil for the last 15 minutes of cooking. Let cool for 20 minutes before slicing. Recipe formatted with the Cook'n Cooking Software from DVO Enterprises.